Find these prebuilt dining room floor plans inside and design your own dining room space. Just follow these three simple steps to design your dining room. 2) Choose a prebuilt template that best represents your dining room space or build a new one from scratch. 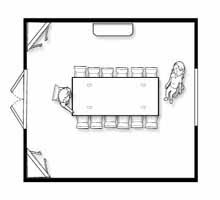 You can adjust room measurements after loading a prebuilt room, so just pick one that is close or has similar shape. 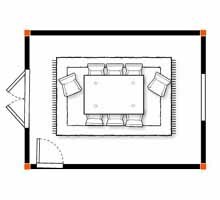 3) Design your own dining room floor plan by dragging and dropping products into dining space. Move chairs around and try different leaf configurations too. Most of these prebuilt rooms will show numerous dining room tables which you can drag and drop to try different size tables and and chair arrangements. Design your own dining room space with ease. Also a great tool to help find the right size rug for your space. Great for counting place settings too. 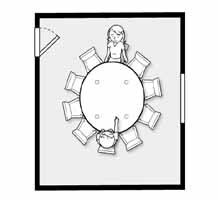 If you are not savy with computers, please check out our "Getting Started" page which shows you how to lay out a table in your home using newspaper and this page will also prevent some common mistakes people make when designing there own dining room. (unless you wish to save, print, or share your work).